ESP is an innovative art exhibit that combines installation art with history, set design, modeling, and altars into an interactive theatrical and artistic experience of African history. 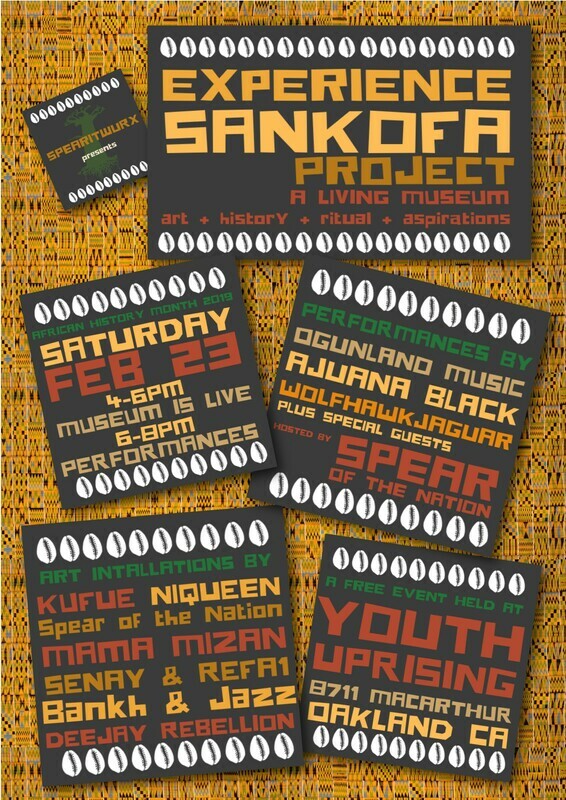 Join artists Kufue, Mama Mizan, DeeJay RebelLion, Niqueen, Jazz & Bankh Akintunde, Senay Alkebulan & Refa1 as we curate powerful and provocative period-specific “living installations” using lights, sounds, smells, and actors/models that evoke visceral emotions as an ode to African peoples’ greatness, oppression, resistance, and aspiration. From the Olduvai Gorge to Timbuktu, the Transatlantic Slave trade to Black Wallstreet, the Harlem Renaissance to the Black Panthers, this exhibit brings history to life, highlighting Oakland's specific contributions. It is our goal that community will glean a better understanding of African/Black peoples’ contributions to human civilization and ignite our collective capacity to build empathy and solidarity to transform our social realities and create a positive future. Participants will engage with the exhibit in two key ways: First, we will host a series of guided tours, experiential reenactments, and facilitated discussions to understand context, causes, and characters that are important to African History. Second, as a part of their experiential learning process, participants are invited to contribute to a collective altar to re-imagine what our future will look like.